Title: The Attacking Manual 1 2nd edition. 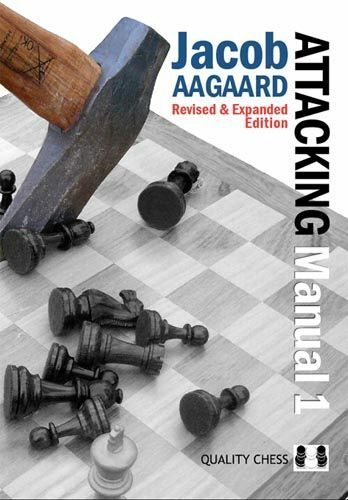 The attacking Manual 1 is a book in which, according to the introduction, Jacob Aagaard has spent a lot of years of his life. The book tries to explain how attacks are conceived more than executed, which is kind of different from other books on attack (see for example Gormally's Mating the Castled King). Don’t lose your Breath: Attack as fast as possible. Add some Colour to your Play: Weakness in a colour complex. Size Matters! : The quantity of the units attacking is also important, not only the quality. Hit ’em where it hurts: Attack the weak points. Chewing on Granite: Attack the strong points so you gain access to the weak points. Evolution/Revolution: While attacking, be mindful that you may stop, gather strength (evolution) and then go at it again (revolution). Apart from that, there are 15 attacking games commented and a last chapter with 50 exercises to solve. Normally I am quite pleased with the quality of QualityChess products, but I must admit that this one is subpar, there are some mistakes in the text and in the diagrams, certainly more than usual. This point is even worse when you think it is a second edition, where this things should have been already solved. Other than that, this is a lengthy book at 320 pages. The book is very well written (if you disregard the problems with the edition) and very appealing, typical of Aagaard's style, similar to those books he wrote for Everyman. The ideas exposed are often very well known, only adding to the known themes new examples. However, it has a chapter on Evolution/Revolution which really made an impact on me. The concept is that when you are attacking, you evolve your position until the point where you cannot evolve it any longer by normal means, and you start sacrificing (revolution). Afterwards, however, you do not need to continue the attack like a mad man, you may stop it to bring reinforcements (evolution). I had never seen this concept anywhere else and found it very interesting. Aagaard tried in this book not to suffocate you with variations, striving to offer only the key variations of the position. I think he has not succeed at all. A lot of times I found myself having to start the engine to show me why the position was in fact winning and not only complex, while other times I was following 10 moves long variations which made no sense to me (surely proposed by the computer) for no apparent reason. In those moments, even if there was a reason, the fact that I did not get it is a flaw. All in all the book is interesting. Its reading is easy and interesting, and you may very well read it quite fast. The analysis may not be the most on point I have ever seen, but it is not bad, just not great. The main problem I find with this book is how easy is to read it and do not assimilate anything. Normally you would be reading quite an interesting paragraph just to be distracted by some game. You would want to finish it as fast as possible to be able to continue with the reasoning. When you realize it, you have finished the book and have learned nothing. I must admit that it is wrong to transfer my personal flaws to the rest of the chess aficionados, but if you are like me, you know you need to make a lot of effort to stop and think instead of read and nod. Personally I liked Gormally's book better, it is cheaper (this book is very expensive, costing 5€ more than its peers at the same publisher) at the same length, it requires more or less the same level from you, it has better analysis (this is: deep when it needs to be, shallow elsewhere), and it has a lot more exercises, which is what gets me going. So I would only recommend this book to you if you have already Gormally's book, and with the strong caveat that to really profit from this book you should have to put the extra effort. PS: I solved the 50 exercises with 10 minutes for each position, working an hour straight in a batch of 6 exercises. With that conditions I was solving a little bit more than half of them (at 2200 fide strength), while with 5 minutes for position I was getting destroyed. Thanks for this review Gollum!. Very interesting and complete. This is how a chess book review should be done. You not only read it, you also have to try it in depth (not just a couple of exercises).